INTRODUCTION | Every machine and process has certain limitations that are directly related to the products it creates. The CNC machine is no different. Every part that is machined must be securely fastened to the bed of the machine which (due to the lack of a vacuum table) necessitates the use of screws which results in wasted material(see Figure 1.) In addition to the fasteners required, the CNC machine we have available in MakeLab has 3 axes (X,Y, Z) of movement which prevents the machining of surfaces with undercuts (see Figure 2, yellow portion is an un-millable undercut.) These limitations can lead to a restricted range of forms that have a flat bottom surface (the surface in contact with the table.) Team ShJB has rejected these limitations and seek to push their use of the 3-axis CNC machine into little known territory: DOUBLE CURVES. DOUBLE CURVES | A double curve is what it sounds like, two curves. The best way to describe it is with a sketch (see Figure 3.) The first curve (top-side) of a double-curve is machined as a single curve with a flat bottom surface. There are two main problems in machining the back surface: alignment and stability/fastening. In order for the part to be machined correctly after being flipped over, it must be perfectly aligned with the original placement of the part. 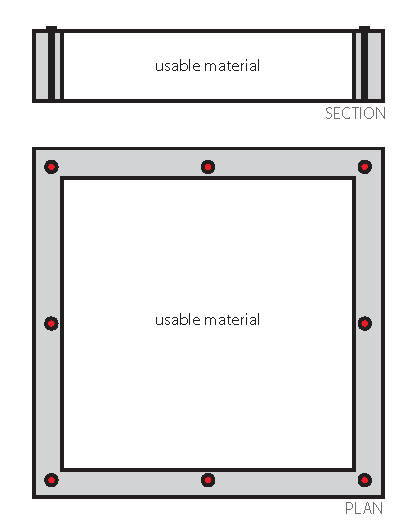 In addition, after cutting away waste material on the first side, there is no longer a flat surface to attach to the table or a location to place the fastening devices (see Figure 4.) This is why double curves are what NOT to do on the CNC. | The movement in plan created a form that varied in width (thinner at the points of motion) and resulted in a double curved shape. ANALYSIS | The biggest question that comes to mind while following this groups process is intent. It comes down to this: if a machine is tailored to create certain output products, should we as designers utilize the machine to the best of its ability within these boundaries, or, should we establish these known boundaries as a launching point and attempt to explore what the machine is capable of beyond them? I think this is a critical question (while lacking of a definitive answer) that this team must face and answer as they start down a path that might not end, or might not exist.